It’s the summer, and that means your children are out of school and staying active. Whether they are playing with friends, spending time at home, or participating in sports, it’s important to make sure you’re protecting your child’s teeth. Your dental professionals at West Liberty, IA can help you keep your child’s teeth looking great and healthy. Gentle Family Dentists has been in the community for more than 30 years, and we love helping families to prevent or overcome dental issues with our elite family dental services! 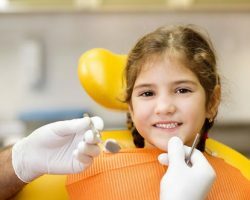 Whenever it comes to your children’s dental health, you can never be too careful. So we want to list a few ways in which you can protect or improve on your child’s dental health. With your children spending more time away from school, they have many more unhealthy food options. Our school lunches strive for balance, and at the very least, the kids have less freedom to select unhealthy foods while they’re in school. You probably know most of the big-time problem foods … The foods and soft drinks chalked full of sugar, but here are some foods that may destroy otherwise healthy teeth that not all parents no about. Sports drinks — We hear a lot about sports drinks replenish electrolytes in our bodies. That’s one use for them, but they also happen to be filled with sugar. Water is a better way to hydrate the body and stay away from harmful sugar. Water also helps flush food debris from the teeth. Sticky candies — Most candy is filled with sugar, but sticky candy is worst because it attaches to the teeth and stays there. Foods high in acidity — It’s possible for foods high in acidity like tomatoes or citrus fruits — lemons or oranges — to damage our enamel. So, eat those in moderate. Most healthy fruits and vegetables have a nice crunch — like apples or celery. Beyond fruits and vegetable, diaries have been proven to reduce the acid levels in the mouth. Children and adults should visit the dentist once every six months. We recommend that you bring your child to the dentist by the time they are 1. During your children’s first dental visits, we’ll simply review the development of the teeth and jaw. Then later we’ll begin cleaning the teeth and providing preventive measures like fluoride and dental sealants. We’ll even be able to evaluate your child for any necessary orthodontic services. Fluoride is a substance we’ll find in toothpaste and most municipal drinking sources. It’s been proven to reduce the risk of cavities and even restore damaged enamel. Dental sealants are placed directly on the biting surface of the teeth and lock out cavities. Dental sealants can last for years with great care. If your child is due for checkup this summer, schedule one as soon as possible. You don’t want a dental emergency coming up when your child is at school. It’s estimated that children lose about 51 million hours of class instruction every year because of dental problems. That also means parents are losing that time away from work. Maintaining those regular visits will keep your child’s teeth healthier and reduce the risk of dental emergencies. Active kids, especially those involved in sports, need to protect their teeth with a mouthguard. Most sports like football or ice hockey require participants to wear mouthguards, but dental and orofacial injuries also can occur during traditional non-contact sports like basketball, soccer, or baseball. In fact, baseball and basketball are responsible for a number of dental injuries in children every year. The American Dental Association recommends that children wear mouthguards during all contact sports and most non contact sports. Basically, if the sport involves a ball, possible collision with another player, or a hard fall to the ground, then it’s recommended that you wear a mouthguard. We offer custom athletic mouthguards for children and adults. Unlike boil-and-bite mouthguards that are available at any drugstore, our mouthguards are made just for one person. We design the mouthguards from a mold of your teeth, and we can make it any color you or your child will like. The custom mouthguard will protect your teeth better than generic mouthguards and do not obstruct the airway. Dental trauma can be painful and extremely expensive! Care for replacing a single tooth can $20,000 over a lifetime. About 5 million teeth in America are knocked out every year due to sports-related injuries. An athlete is 60 times more likely to injury their teeth or mouth when they DO NOT wear a mouthguard. Any athlete involved in a contact faces a 10 percent chance every season of injuring their mouth or teeth and between a 33 to 56 percent chance over the course of their career. Mouthguards and facemasks in sports like football or lacrosse prevent about 200,000 dental injuries in America every year. Gentle Family Dentists is here to treat your children and educated everyone who walks into our office. We hope you’ve learned a little more about how to better protect your children’s health. But there is much more to cover. We’d love to see you and your children in our office. You can schedule a visit with us by calling our office today at 563-288-2612.